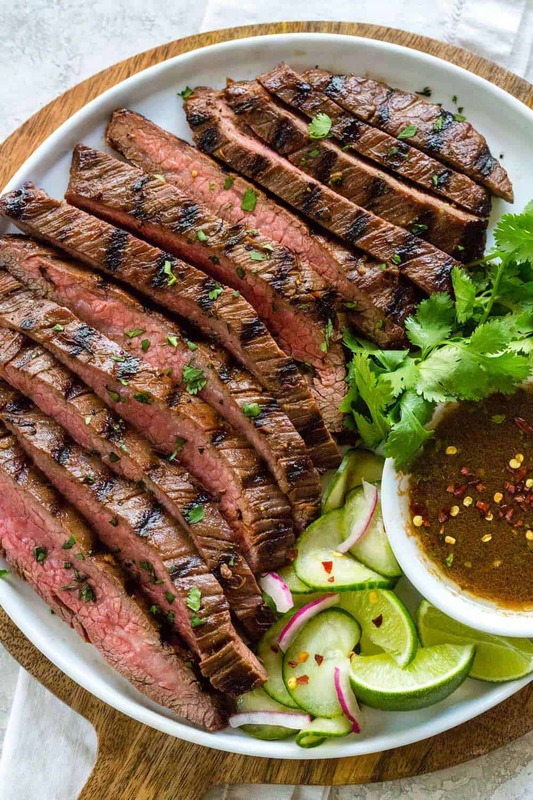 Grilled flank steak marinated in a bold Asian-inspired mixture of soy sauce, ginger, garlic, sriracha, and fish sauce to add a tasty boost of flavor. Seared on a hot grill to create beautiful char marks and perfectly cooked in 10 minutes or less! Hi there! 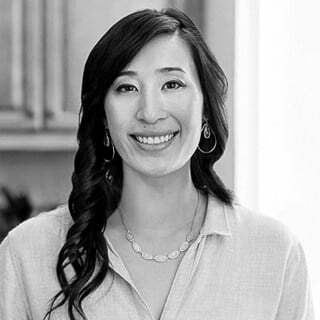 It’s Jessica Gavin, Certified Culinary Scientist and I’m thrilled to share another delicious recipe on Alyssa’s website. With the good weather lately, it’s time to cook outdoors on the grill. There are two techniques that I use to maximize the taste of flank steak for this recipe. Marinating the meat for just an hour before it hits the barbecue intensifies the beefy flavors. Then grilling on extremely hot plates create stunning grill marks while this lean cut of beef cooks quickly. This meal is a family favorite that doesn’t take much effort to prepare, which is a win for all! This steak recipe is meant to slice and share. It’s great for a simple weeknight meal, potluck, or summer celebration that can feed a crowd. 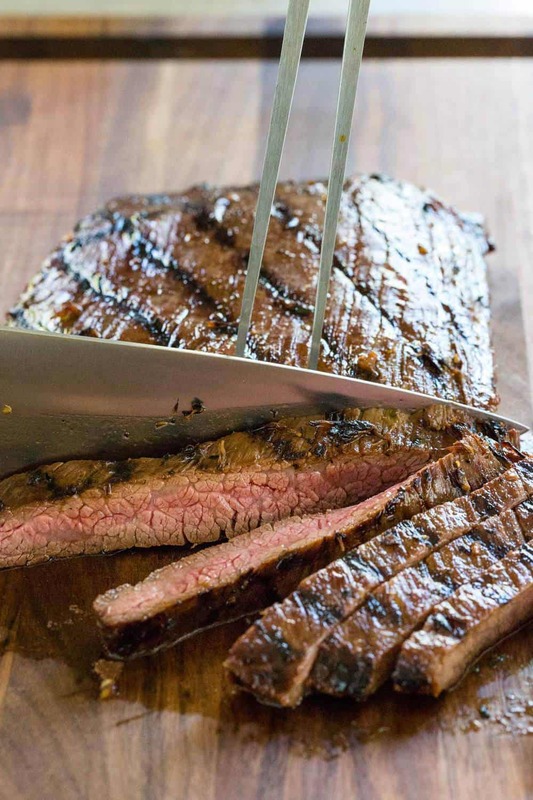 Flank steak has grown in popularity and it’s no surprise why. This affordable cut of beef is located just below the loin, making it a thin and coarse steak with remarkable grain lines. This also assists in easily being able to detect where to slice against the grain which makes it easier to chew. This steak’s claim to fame is being lean and intensely flavored. It’s easy to cook for those just beginning to learn how to grill. Flank is also ideal for stir-frying and broiling. With more surface area available, this provides more flavor infusion opportunity when a steak marinade is applied. 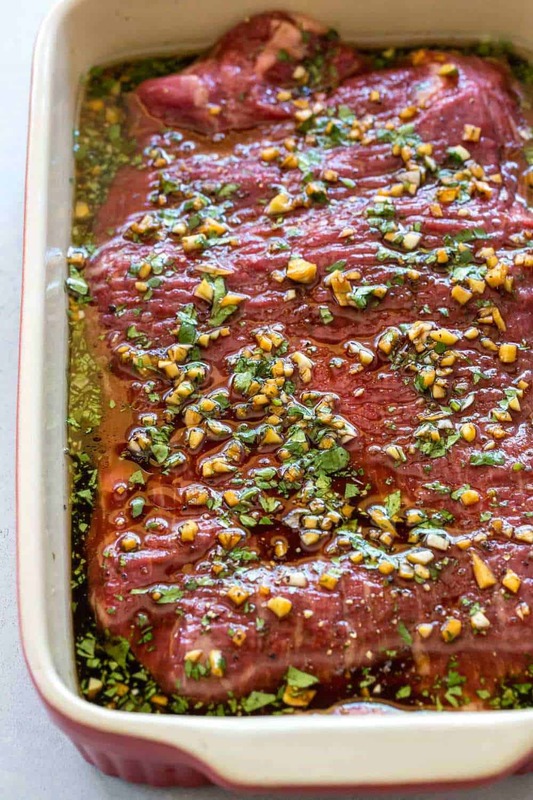 The benefit of utilizing a marinade for beef is two-fold. It infuses water-soluble flavor compounds into the interior of the meat from the salt, soy sauce, garlic, ginger, onion, honey and fish sauce, making each bite undeniably more impactful and the brining effect makes it more tender. The fat-soluble flavor compounds from the chilis in the sriracha and black pepper dissolve in oil, stick to and flavor the surface. The bottom line, it tastes better! Traditionally marinades include an acid, like lemon juice or different types of vinegar. It’s a natural flavor enhancer that provides a punch of brightness but is more often known to make meats more tender. However, if too much is used or the contact time it too long then undesirable things happen. The meat can become mushy on the surface and dried out. To prevent this, a portion of the soy marinade is reserved and combined with lime juice to be used as a sauce for serving. The flavor benefit of the acid is still present without impacting the texture of the steak. This grilled flank steak is a dish that’s a breeze to prepare and requires minimal grill time. That means it will be devoured faster than it was cooked! I like to accompany the steak with some pickled cucumbers and lime wedges to squeeze on top. It’s a wonderful Asian-inspired low carb meal that I can assure you everyone will enjoy! 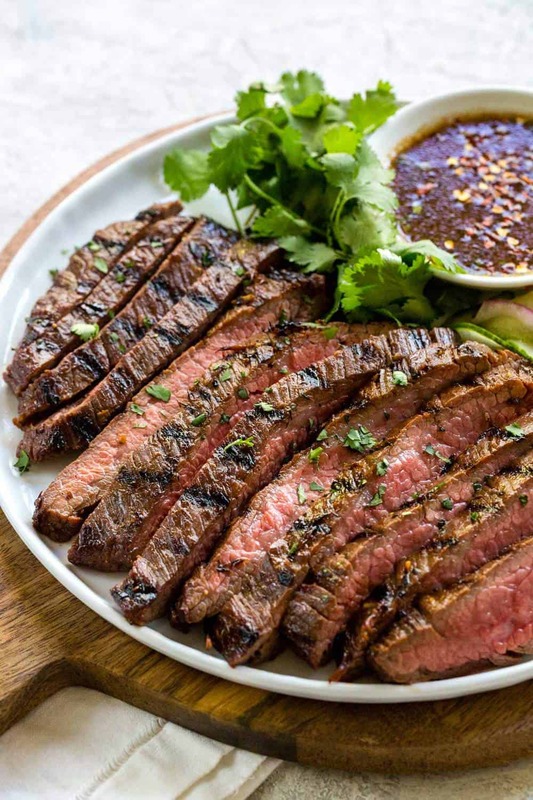 Grilled flank steak marinated in a bold Asian-inspired mixture of soy sauce, ginger, garlic, sriracha, and fish sauce to add a tasty boost of flavor. 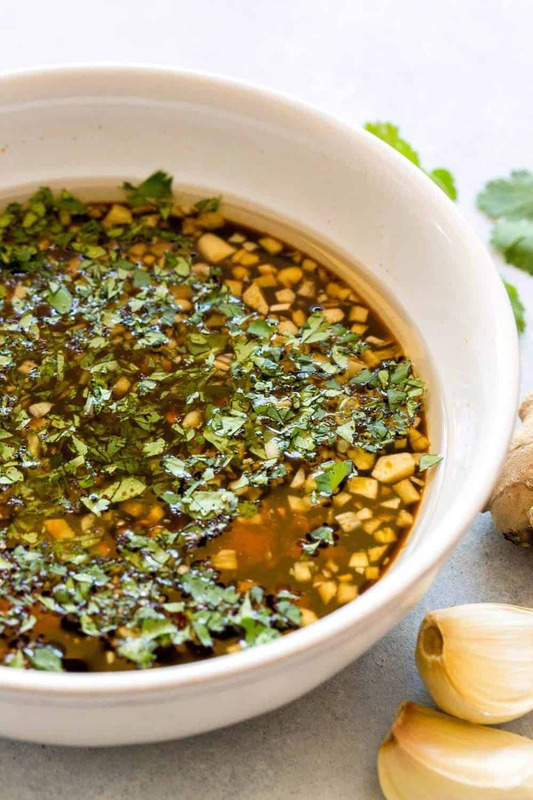 In a medium-sized bowl whisk together soy sauce, vegetable, red onion, maple syrup, garlic, ginger, cilantro, salt, fish sauce, sriracha, and black pepper. In a small bowl add ¼ cup of the marinade mixture and lime juice, set aside. Add flank steak to a baking dish or large resealable plastic bag. Pour the marinade over the steak, cover and refrigerate for 30 minutes. Flip steak over, cover, and marinate 30 minutes in the refrigerator. Remove the flank steak from the marinade and pat dry with paper towels to remove excess moisture from the surface. The chamber temperature should be between 400 to 450ºF. Add a small amount of oil on a folded piece of paper towel, and then carefully grease the cooking grid with the oil. Once the grill reaches the recommended temperature, place the steak on the grill and close the lid. Cook the steak until charred marks appear, 4 minutes. Flip over and cook covered until desired doneness is reached, about 2 to 4 minutes. For medium rare (120 to 125ºF) or 130 to medium 135ºF (50 to 57ºC) internal temperature. Slice the grilled flank steak against the grain. Pour reserved marinade over the steak or serve on the side with lime wedges. yummy marinade, love the flavors, thank you!